During surgery, the anesthesiologist or nurse anesthetist are like umpires. If they do their job well, no one notices them. But when anesthesiologists make mistakes during surgery, the harm to the patient is often catastrophic. This page discusses anesthesia malpractice lawsuits. If you believe you have a claim for a mistake and would like to speak with an anesthesia malpractice about your options, call 800-553-8082 or get an online case evaluation. Approximately 40 million anesthetics are administered each year in the United States. There are three types of anesthetics: local anesthetics, regional anesthetics, and general anesthetics. Local anesthetics are used for small areas of the body (e.g. numbing tooth for filling a cavity).This type of anesthetic usually lasts for an hour or two. A regional anesthetic may be used during labor, or sometimes on limbs of the body. General anesthesia is that you think it is: being "put under" where you are, if done right, unconscious and have no memory of the procedure. This type of anesthetic is used for more serious procedures: heart, lung, brain surgeries, and the like. Anesthesiologists in operating rooms are responsible for providing a continuous medical assessment of the patient including monitoring vital signs (heart rate, blood pressure, temperature, respiratory rate, etc.) and administering anesthesia to control the patient's pain level and state of unconsciousness. After surgery, they are responsible for post-anesthetic evaluation and maintaining patients in a state of comfort. 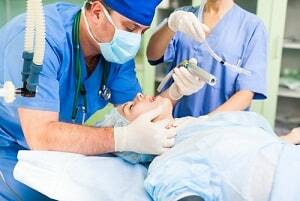 Types of anesthesia malpractice include burns from materials or devices heated and used to warm patients (e.g., heating pads, IV bags, warming lights and hot compresses), cautery burns/fires, eye damage, nerve damage (e.g., cervical cord injury), awareness, trauma and drug allergies or interactions. Trauma includes but is not limited to, intubation problems, endotracheal tube insertion, and removal of tubes. Intubation problems can occur due to misdirection of the tube down the esophagus which may damage the throat structures (thyroid cartilage, larynx (voice box)). Endotracheal tube malpositioning can lead to lung or heart damage. It is also critical that the anesthesiologist is aware of the patient's current medications and allergies so adverse reactions can be anticipated and managed accordingly. Anesthesia-associated nerve injury is a common cause of malpractice lawsuits. The most common injury was to the brachial plexus, followed by ulnar nerve injury, radial nerve injury, peroneal nerve injury, paraplegia, lumbosacral injury, and a variety of "other" injuries. Studies have found that for most Anesthesia-associated nerve injury lawsuits, a reoccurring issue is the lack of proper intraoperative protective padding and errors in patient position. There are also a large number of malpractice lawsuits from anesthesiologists misusing the tourniquet during a procedure. Pregnant women and the kids are two groups that have a further risk for complication with anesthesia. Obstetric anesthesia malpractice claims include maternal death, maternal brain damage, newborn brain damage/neonatal death (all of which usually involve difficult intubation) maternal nerve injury (due to regional anesthesia), headache and back pain. Though maternal brain damage, maternal death, and newborn brain damage/death have decreased over time, there has been an increase in the number of claims for maternal nerve damage and back pain. Newborn brain damage/death is reported to be associated with poor communication, poor anesthesia care in response to intubation and anesthesia delay. The most common adverse events in anesthetic malpractice claims in pediatric care include respiratory events, cardiovascular events, brain damage and death. There are not as many medical malpractice lawsuits against anesthesiologists as there were 30 years ago. Back then, the profession was riddled with malpractice claims. Juries were repeated hitting these doctors with large malpractice verdicts. Now there are far, far fewer claims. Why? The answer is medical malpractice lawsuits. Instead of crying for tort reform -- okay, they did that too, actually -- anesthesiologists simply got better. The revised bad procedures, they changed work rules to fight fatigue, and the demanded and got the equipment they need to keep patients safe. As a result, the mortality rate from anesthesia nose-dived from 1 in 6000 administrations to 1 in 200,000. Look at those number again. It is amazing. Today, while the settlements and verdicts in these cases are still very high, anesthesiologists have the lowest malpractice insurance rates fell off any major medical specialty. One anesthesia complication is anesthesia awareness. The patient receives medication that paralyzes them from calling for help, but the patient remains conscious. The patient is helpless to expresses the awful pain and must suffer through the surgery fully aware. According to the ASA Closed Claims Project, anesthetic awareness occurs at a rate of 0.1% to 0.2% of general anesthetics. Causes of awareness include light anesthesia (37%) and anesthesia delivery problems (28%). In a third of the cases, the cause is unknown. 2016, Illinois: $7,884,762 Verdict. A sixty-year-old female is having a celiac plexus neurolytic block procedure with absolute alcohol performed by an anesthesiologist, even though this procedure is not indicated. The anesthesiologist fails to properly identify the landmarks during performing the procedure and fails to treat the patient's pain with a more conservative method. Further, the anesthesiologist does not have the privilege to perform the specific procedure, and he fails to place the spinal needle in the proper place. The patient dies as a result, and her husband and two sons bring a wrongful death suit. The anesthesiologist denies negligence, but a jury awards a whopping $7,884,762. 2015, Oregon: $12,195,500 Verdict. A 51-year old male has aortic valve replacement surgery at the hospital. The surgeon orders 150 mg of Amiodarone, which is the standard dose. However, the anesthesiologist administers 2,700 mg. This results in an anoxic brain injury due to the overdose, leaving the man no longer able to work or walk on his own, requiring 24/7 care. A jury awards him $12,195,500. 2015, Massachusetts: $900,000 Settlement. A 39-year old female is having surgery for uterine fibroids. While she is under general anesthesia, her blood pressure drops and remains at an extremely low lever for forty-five minutes. Finally, her heart rate and blood pressure are restored to normal, but she never regains consciousness. She is in an irreversible coma for six days and then is pronounced dead. Her estate brings suit against the anesthesiologist and the resident doctor, claiming they allowed her blood pressure and heart rate to go to slow and deprived her brain of oxygen. The defendants maintain that the anesthesia was reasonable and appropriate. In a confidential settlement, the case settles for $900,000 before trial. 2015, New York: $500,000 Settlement. A 54-year old female is undergoing a biopsy when she goes into cardiac arrest right after the procured ends. She brings a claim against the doctor who administered the anesthesia and against the doctor performing the procedure, claiming that failed to perform alternative testing not involving anesthesia and improperly administered the anesthesia. The defendants denied liability. The parties settled before trial, with the doctor who administered the anesthesia responsible for $375,000, and the biopsy performing doctor responsible for $125,000. 2015, California: $500,000 Settlement. A 60-year old male is admitted to the hospital with obstructive jaundice. He undergoes an endoscopic procedure, during which complications arise from the administration of anesthesia, and he dies. He minor son brings a medical malpractice suit, and the case resolves at mediation for $500,000. 2015, Michigan: $120,000 Settlement. A 75-year old woman is a patient at Harper University Hospital, planning to undergo an MRI with unconscious sedation. Immediately after the induction, she becomes unresponsive and hypotensive. She dies. She brings a claim against the hospital and anesthesia services, claiming they were negligent in providing the anesthesia in inappropriate doses and failing to control her blood pressure and heart rate. The case settles for $120,000. 2014, California: $7,000,000 Settlement. A 31-year old adult female goes to San Bernardino Community Hospital to deliver her fourth child. During a tubal litigation following this, she suffers cardiac arrest and cerebral anoxia, resulting in a chronic vegetative state, while under the care of the anesthesiologist. His estate brings suit, alleging that there were grossly inadequate pre-operative work-ups and a communication breakdown. The parties settle for $7,000,000. 2014, New Jersey: $3,970,000 Verdict. An adult female is having a right knee arthroscopy done at JFK Medical Center when she experiences a cardiac arrest, sepsis, and pneumonia under the care of her anesthesiologist. She claims that the anesthesiologist failed to administer drugs for the cardiac arrest, failed to assess the risks to the patient and failed to safeguard her airway (along with many other things). The defendants deny violating the standard of care. But the jury awards $3,970,000, which the parties later settle at a judicial conference for $3,500,000. 2014, Massachusetts: $750,000 Settlement. A female patient is having bilateral cosmetic eyelid surgery done by her oral maxillofacial surgeon. During the procedure, the doctor uses local injections and intravenous anesthesia. After, the woman has vision in both her eyes. However, during the next week, her vision diminishes continually until after a month she has lost her eyesight completely. A vision specialist determines she has no vision in her left eye, and an MRI shows a swollen optic nerve due to suffering a complete optic nerve atrophy in her left eye. She brings suit against the defendant, claiming negligence in the injection of anesthesia resulting in nerve damage that is irreversible. The parties agree to a $750,000 confidential settlement before trial. 2014, Alabama: $1,400,000 Verdict. An adult male is having a kidney stone removed at St. Vincent's East. The anesthesiologist does not supervise the administration of anesthesia by the student nurse anesthetist. After the surgery, the patient suffers respiratory distress and cardiac arrest, resulting in permanent brain damage. She is transferred to the Long Term Care unit of Noland Hospital. She dies about a month later from sepsis syndrome, toxic epidermal necrolysis, and hypoxic encephalopathy. His wife files a wrongful death action based due to the medical malpractice. 2014, Michigan: $7,896,538 Verdict. A 24-year old female is hospitalized with a dilated common bile duct, nausea, and vomiting. Anesthesia is administered so an endoscopic procedure could be performed. But the patient dies after the anesthesia is administered. Her estate brings a claim, alleging the doctors failed to protect her airways and by using IV sedation instead of general anesthesia. The doctors argue that the death was not due to the method of anesthesia, but due to a heart attack and pulmonary embolism. A jury reaches a verdict for the plaintiff for $7,896,538. 2014, Pennsylvania: $1,100,000 Settlement. A woman undergoes a sinus surgery and then dies due to respiratory issues and surgical cardiac arrest complications from general anesthesia. She brings suit against the doctors, claiming they failed to perform adequate pre-op workups and should have been aware of possible post-surgical complications, and further that the oxygen and airway levels were not properly monitored. A lump sum settlement agreement for $1,100,000 was reached. If you live in the Baltimore-Washington area and believe you have been a victim of negligent administration of anesthesia in Maryland, call 800-553-8082 or get a free online consultation. What is the value of your medical malpractice case?